Please activate the green arrow below to view a slide show produced from the Museum's collection of official and soldier's photo album pictures of the training in the UK and war in South Africa. The Commanding Officer of the New South Wales Lancers visited London privately in 1898. There he arranged for a squadron of one hundred to be quartered, fed, horsed and trained at the chief cavalry centre at Aldershot, Hampshire, 60 km south west of London. Lord Carrington, honorary colonel of the Lancers and others in England contributed £500 to the endeavour. When he returned Colonel Burns opened a fund with £300; Regimental officers and other supporters soon subscribing £2,000. The members of the Regiment were approached, and it was found that each applicant was prepared to pay their own fare of £20. This would mean costs for the whole enterprise could be covered. On 20 February 1899 the squadron pitched camp at Lancer Barracks, Parramatta. Four days after assembling, a night display was given at Victoria Barracks, 12,000 people were in the audience. Departure was on the SS Nineveh on 3 March, anniversary of the formation of the Sydney Light Horse in 1885. 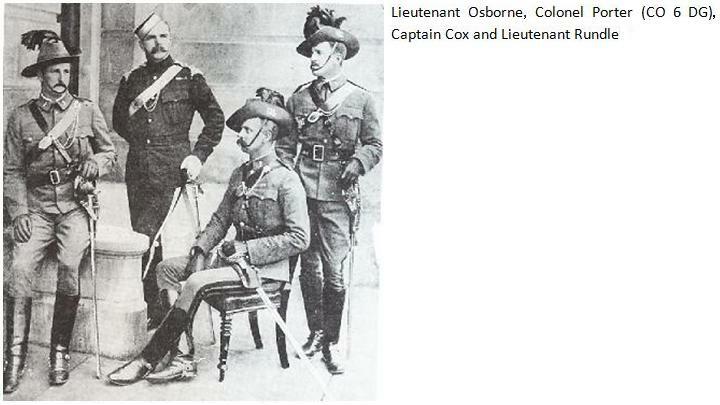 The Officer Commanding was Captain CF Cox, troop commanders Second Lieutenants SF Osborne, and WJS Rundle; the Sergeant Major H Read, Staff Sergeant Major H Robson. Fifty six days out of Sydney, the Lancers arrived in London. On a crisp April morning, led by the band of the Coldstream Guards, they marched through the city to Waterloo station. Aldershot was reached and the Lancers settled into barracks attached to the 6th Dragoon Guards; their horses were provided by the 15th Hussars, recently despatched to India. Training was hard, sword, lance and riding; daily drills in the “Long Valley”, a particularly dusty environ. Many field days in the countryside took place in late summer; speed and shrewd use of hills and valleys from officers’ down to troopers’ patrols made the Lancers successful and respected. The Royal Military Tournament was held in the Agricultural Hall at Islington. 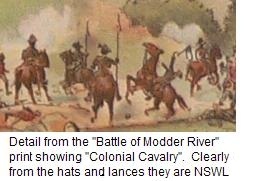 In the period 25 May to 8 June twenty six performances of a “Cavalry Display by the 6th Dragoon Guards and New South Wales Lancers” were given. The display being a sham engagement. Some of the Lancers had to dress as enemy “Dervishers”. The soldiers took both a kangaroo and an emu with them as mascots. The emu died pretty early reputedly from eating something inappropriate, the kangaroo survived, eventually living out its days at High Wycombe, Lord Carrington’s property. 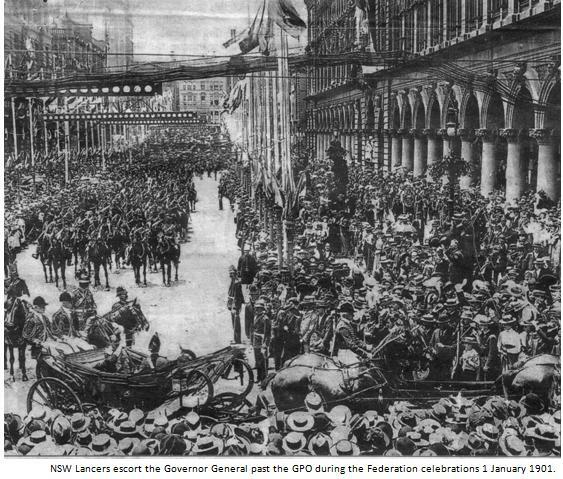 The NSW Lancers were attached to General French's 1st Cavalry Brigade until October 25 1900, when their term of engagement was up and the New South Wales Government desperately needed them at home to take part in the celebration of the new Australian Commonwealth. The squadron became involved in a strenuous campaign of continuous movement. They were fortunate in serving under the man who had lately been their brigadier at Aldershot. On 7 December, the 6th Dragoon Guards, New South Wales Lancers and New Zealand Mounted Rifles moved out to Tweedale and remained there, while some kopjes, 5 kilometres north of Arundel, were occupied. To these "A" and "B" Squadrons, 6th (Inniskilling) Dragoons, marched in from Maitland. There had been some heavy fighting in the neighbourhood and the enemy strength at Taaiboschlaagte was estimated at 3,000, at Colesberg 3,000 in addition to which commandos were moving up. In the second week of December a base camp was established at Arundel, and it was to this camp that Troopers Herbert Vernon and George Cummings, who had left the Aldershot contingent in London, came to rejoin the squadron and draw horses. "At 03:00 hours," Trooper Vernon writes in his diary, "my troop, about 20 mixed Lancers and 1st Australian Horse under Lieutenant Dowling of the latter, set out on patrol. I was in charge of a prisoner at camp. About 15:00 hours Tpr Eames (A.H.) rode into camp, having escaped from a kopje where the troops had been surrounded and penned up by wire fences: Tp Sgt-Maj. Griffin (AH) killed; Cpl Kilpatrick (NSWL) wounded badly and Tpr Roberts (NSWL) shot in one hand. We volunteered to go in pursuit, but Colonel Porter stated the horses required rest: we then volunteered to go on foot, but he would not allow it. The last two escaped from the prisoners' laager at Waterval and, after gruelling experiences and hairbreadth escapes, almost without saddles. Most of the three months later, reported to the British Consul at Lourenco Marques in neutral Portuguese territory. CLICK HERE to read about their daring exploits.. Allowed a swim in the dam - very necessary,” writes Trooper Vernon laconically; adding, disgustedly, "but as some plutocrat used soap this luxury was immediately stopped." At the end of January 1900 General French left for Cape Town to meet Lord Roberts and arrange for his now famous march to relieve Kimberley. The Scots Greys with "A" Squadron, 6th Dragoons, attached, left for Modder River. •	1st Brigade (Porter) : 6th Dragoon Guards, l4th Hussars, one squadron of Scots Greys, "A" Squadron Inniskilling Dragoons, NSW Lancers. •	2nd Brigade (Broadwood) : Household Cavalry, 10th Hussars, 12th Lancers. 3rd Brigade (Gordon) : 9th and 16th Lancers, seven batteries of Royal Horse Artillery. •	Two brigades of mounted infantry joined the division on February 13. “Kimberley was now only 32 kilometres distant," writes Trooper Vernon, "and all were keyed up to effect the relief though many knew they would have to 'foot it' and carry their arms. The advance in early morning led along a valley about three kilometres wide with Boers and guns on the hills on each flank. It was here our carbines, sighted only to 800 metres, did telling execution at from 1,200 to 1,500 metres, as the firers got good observation of strike on the dusty ground. We continually moved parties of Boers about for an hour. The British had the same Martini-Enfield carbine as we had, except that theirs had magazines. Next day the Lancers were joined with "A" Squadron, Inniskillings, since that squadron mustered only 42 horses. The whole under Major Allenby made the combined number of horses 170. In his book Major Yardley writes: "The N.S.W. Lancers, under Major Lee, were attached, and thereafter they remained with the regiment, rendering yeoman service until their return to NSW." "16 February. Up at daylight and disgusted with the condition of our mounts the 1st and 3rd Cavalry Brigades marched about 16 kilometres, the sand throwing up a heat that scorched even the air; several tongues were black and not a dam to be seen. On Dronfield Ridge we lay in the grass for about an hour 200 metres from a Boer trench, under their fire; during another `reinforcing', two Scots Greys, one on either side of me, were shot dead. The NSWL and `A' Sqn, 6th Dragoons, covered the retirement at nightfall which was slow as the infantry were carrying their casualties. Scores of dead horses were passed. Took prisoners including several Boer snipers in the low trees: one would not come down until gently urged by my lance point; he said he was only hiding but we found his rifle planted and many Schneider shells; handed him over to the Infantry, happy in knowing that when interned he would be forced to wash.
Bloemfontein having surrendered, it now became necessary to clean up the many Boer strongpoints and camps in the neighbourhood. On 16 and 17 March Major Allenby with 100 Inniskillings, New South Wales Lancers and Carabiniers safely escorted a convoy to Thaba Nchu, via Sanna's Post and back to Wessel's Farm. Two weeks later, the 1st Brigade with two days' supplies marched to Rondeheuval and took part in the action at Karee Siding. The enemy having been cleared out, the infantry took over the position, and the brigade returned to its camps near Bloemfontein on the 30th. 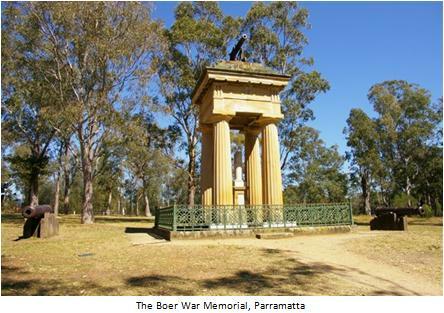 A move was made next day to the sound of guns, the brigade bivouacking at Springfield, nine kilometres to the south-east. The strain on the Cavalry Division was now beginning to tell, and its strength on the last day of March showed only 830 men with horses, "A" Squadron of Inniskillings turning out only five officers and four men. This was the day of the reverse to Broadwood's force at Sanna's Post, some 32 kilometres further east. May 30. To 16 kilometres due north of Johannesburg. At night Lieutenant Johnston, 6th D. with "Banjo" Paterson and six men penetrated the enemy with General French's despatches for Lord Roberts at Germiston, returning safely after hairbreadth escapes." 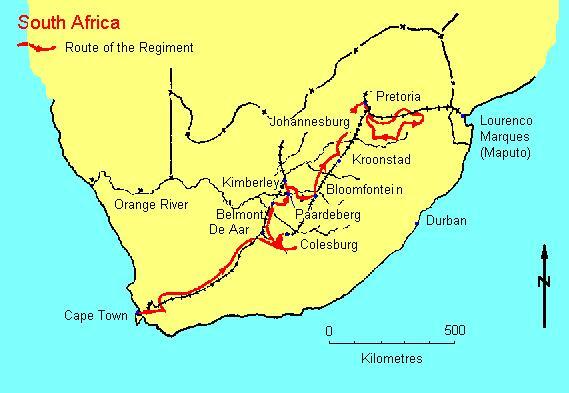 On 1 June the cavalry moved to Ber Vlei, and two days later crossed the Krokodile River and moved 32 kilometres to Kalkheuvel Pass. Here there was heavy fighting in rocky country. The Carabiniers and 6th Dragoons in advance were ambushed, and even General French galloped back, through a hail of bullets. Lieutenant Rundle (late New South Wales Lancers) had three horses shot under him, but the New South Wales Lancers and one squadron of the 6th Dragoons rallied, dismounted, went into action and prevented further panic. "All credit for this must be given to Major Allenby," writes Yardley, "the NSW Lancers under Major Lee, and the Inniskillings supporting the Carbs." The division was critically jammed in a ravine all night, but luckily the Mafeking Commando retired. The advanced guard cleared the pass on June captured a large supply of provisions and bivouacked at Zilikats Nek under the Magaliesburg Range, due west of Pretoria. There were now only 30 men left in "A" Squadron. The release of the 3,500 prisoners at Waterval on June 10 was a joyous and exciting event. "On the British coming within view of the barbed wire enclosures," writes Trooper Vernon, "the prisoners burst out cheering, and during the next few hours were headed to safety, the Boers shelling them and the 100 warders alike, and also a hospital train for the sick. The prisoners were too excited to assist in their own getting away, which lasted until after dark. 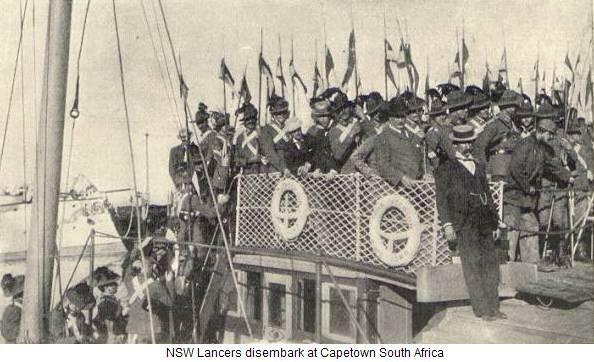 Captain Nicholson and two troops of the NSW Lancers did good work in the fight of 400 of the brigade against 2,000 Boers." During the next three weeks the men rested and rehorsed. One hundred of the lOth Hussars were distributed throughout the regiment, staying for several months, bringing the strength up to 500 men mounted. On July 8 Sergeant J. W. W. Campbell was evacuated with enteric fever, and on July 9 the regiment marched 40 kilometres to Grootfontein. This long march and winter weather conditions proved too much for the "soft" remounts, and many had to be destroyed. Another 40 kilometre march on 10 July brought the regiment past Rietfontein, and at noon of the fallowing day Leeupoort Hill near Oliphantsfontein was taken. Building stone sangars for defence, the regiment held the position for three days, surrounded by the enemy in force. On 14 July, Troopers B. F. Evans and G. E. L. Ramsay were evacuated with enteric fever. At dawn on 16 July the enemy rushed two picquets. They were repulsed by the New South Wales Lancers. Two days later the regiment moved to Oliphantsfontein, and on 21 July the 4.7 inch gun (called a "cow gun" because it was drawn by oxen) shelled 800 Boers. During the 40 kilometre march to Dieplaagte a week later Captain Ebsworth, lst A.H, an international cricketer, was killed by a spent bullet at 2,000 metres. 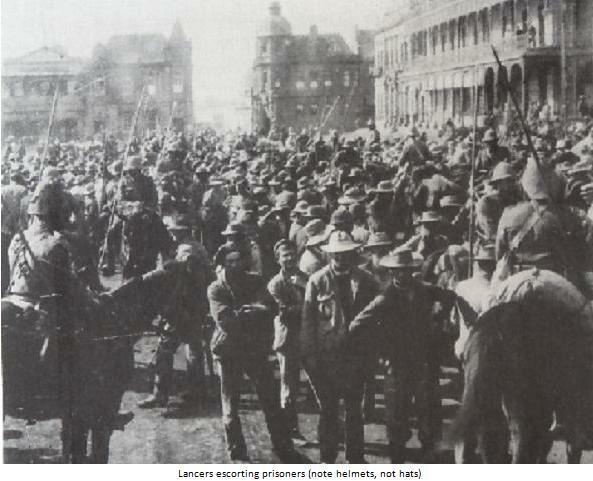 Another march on 24 July, the regiment as advanced guard in extended order, ended in a brigade bivouac at Bosmansfontein, and at daylight, in bleak and bitter cold, the brigade marched at 09:00 hours, seizing Naauwpoort Drift on Oliphants River. So severe was the weather, the troops being bivouacked in torrents of cold rain, that one officer died later of exposure. On July 26, as advanced guard, the regiment seized a hill from the Boers, and moving at 10:00 hours next day, Erfdeel Drift was taken, and Greenfontein held. Next day "A" Squadron, whose strength was down to 30 men, made a reconnaissance to the Komati River and met with great opposition. Major Allenby sent the NSW Lancers squadron to support on the left flank; this led to the retirement of the Boers and enabled "A" Squadron to push on. On the same date 100 of the Carabiniers were attached to the Inniskillings, and that night the regiment retired and took up an extended outpost line near Goedehoop. Throughout the next fortnight, the regiment, under Major Allenby, with two guns and a pom-pom and the 100 Carabiniers (Major Hamilton) held a line of about 13 kilometres at Goedehoop. The enemy were very aggressive and in strong force all round. The greatest vigilance was necessary, and the constant outpost duty proved very trying to all ranks. The regiment was organised into six small squadrons of 40 men each. "British Warms" (short overcoats) were issued to all ranks for the first time about 16 August, and proved to be of great benefit. 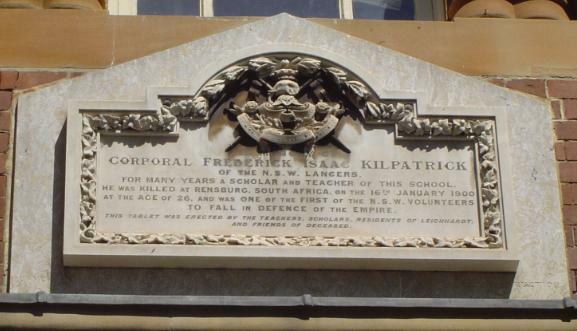 On 21 August the regiment proceeded to Blesbokspruit, and, marching at 04:00 hours on the 26th, fighting at close quarters all day,reached Vlakplaats on the 27th. Here it was again selected to take the ridges opposite, occupied by the enezny in force, with two guns. Marching as advanced guard through country full of precipices on the 29th, Helvetia was reached at midday, and the men bivouacked that night on the heights above Waterval Onder. Next morning the Inniskillings occupied the hills 300 metres above the town. In the afternoon "B" Squadron gained the town, galloping through a hail of bullets and, under cover of dark, bringing away a number of prisoners. The success caused the enemy to release all our prisoners at Nooitgedacht, a few kilometres away. Among the released was Lieutenant Rundle. 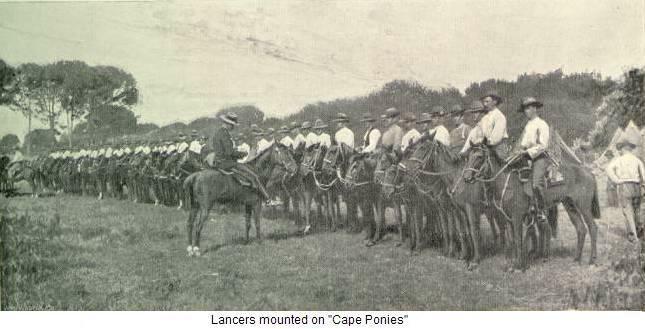 On the last day of the month, the cavalry proceeded to Machadodorp, a town which had been used for some time by Mr Kruger as the capital of the Republic. 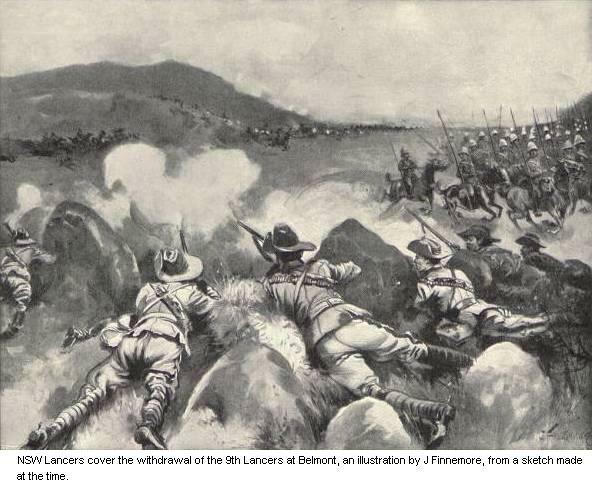 Two days later, on advance guard to Tevreden Hills, the regiment surprised the Boer main laager, and with great difficulty got out with 33 casualties in the Inniskillings. Major Yardley was shot in the thigh and his clothes riddled by bullets. That night the bivouac was at Witkraus. Next morning at 4.30 a march was started to Ermelo, with outpost duty at night. Farrier Sergeant E Rose and Trooper AH King were wounded and Sergeant-Major GE Morris and Sergeant EAE Houston were awarded the DCM for dashing work under fire this day. On the return of the squadron primarily at the behest of the New South Wales Government in order for a "good Show" at the Federation celebrations (1 January 1901), Colonel Burns wrote to the Governor-General recommending that the regiment might be allowed some honourable distinctive title, such as the Royal Australian Lancers, or King's Own Australian Lancers." This request was passed through the usual channels as far as the Prime Minister who concurred with the advice of the Minister of Defence that "this is a delicate matter, and might I think stand over until we have a General Officer Commanding". In April 1902 the new GOC, Sir Edward Hutton, wrote declining to recommend it at that time and pointing out that it would not be expedient to select any one special corps for the high distinction proposed without very careful consideration of the claims of others.